Multimedia combines five basic elements of media into the learning environment: Text, Video, Sound, Graphics and Animation, thus providing a powerful new tool for education. All these elements are required to disseminate knowledge through Digital Content. Some concepts require real-time Images and Videos for better understanding. Some topics are better explained using animations. Animations are of 2 types, 2 dimensional (2D) and 3 dimensional (3D). Some concepts are better explained using 3D. In recent years, 3D entered our lives through TVs, Projectors, Monitors, and Computers etc. 3D technology is widely used in the field of education, as it command the attention of the student. We have added 3D animations for better understanding and visualization of the imaginary concepts as per the suggestions of the Subject Matter Experts. 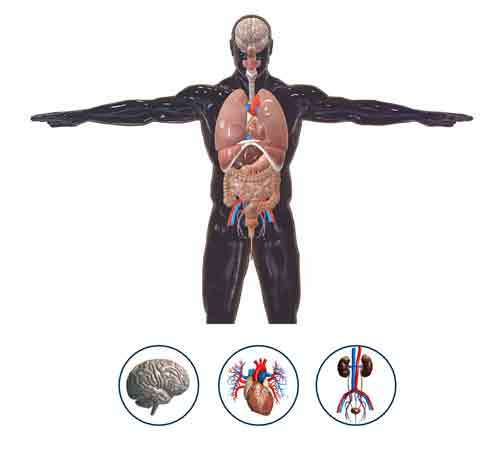 To start with, we have developed Human Anatomy 3D course.